The Vikings were known for grit, fearlessness, and exploration; they were not known for having skilled barbers or hairdressers. So as a result, they sometimes looked a bit shaggy. Men braided their beards to keep them tidy. But it turns out that the shaggy, unkempt look was a good thing, because it made their warriors look really fierce when they faced their enemies! Now, we have modern technology and tools to keep ourselves looking neat and clean. Can you imagine showing up for your Monday morning All Hands meeting with beard braids? (Actually, that could be kind of fun!) 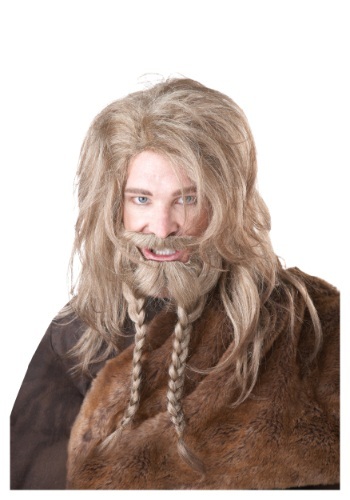 Lucky for you, you can get that ideal Viking look for your costume without depriving your barber of income when you wear this Blonde Viking Wig, Beard and Mustache. It looks wild and ready to set sail on an adventure beneath a horned helmet for Halloween!